"The Work Wouldn't Make Sense if All the Best Had Already Been Painted." --[Jakub Paczek speaking with Anna Fornelska. Juliusz Joniak once said about Anna Fornelska, "She holds the key to the to the secret garden". Indeed, in her artwork we can feel indescribable atmosphere, showing the artist's passion and some kind of secret she wants to announce to the audience through very sophisticated artistic and colour form of her paintings. Anna Fornelska's fantasy still seems to have no limits and is still proved by her newest paintings. You come from family with the long traditions of painting. Your parents were painters. Your grandfather used to paint, too. How strong was their influence on your decision to study at the Academy of Fine Arts? In fact, my grandfather was only an amateur painter, but my grand grandfather was an architect and a collector. I think I had no choice, I had been listening to my parents talking about art and watching their work my entire childhood. I owe them much. I made the decision about studying on Academy of Fine Arts in the final class of high school, somehow against my parents. They weren't aware of my determination. On many of your paintings we can see a window. In spite of the view inside being changed the first plan seems to be one and the same window. Does this window really exist? I work for years so far in my workshop with one big window. On the other side wild grains grow and change the colors depending to the season and the day time. Where came the idea to make it the main motive in your artwork from? This idea comes itself. Using nature and my own memory sometimes I'm making some transformations, putting out memorized landscapes. While living in Tunisia I worked with the window of real garden - I put on the hedge the objects from the hundreds of kilometers distant workshop. In many of my paintings are visible the same kettles and bottles. What is the inspiration for these fantastic landscapes which are seen on your paintings? I work in a plein-air often. Not that big, fast sketches I use afterwards in the workshop. You have learnt in workshops of Kunz, Banaszewski and Maciejewski. 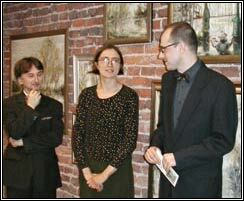 Especially the last one has become famous after the exhibition "Maciejewski and his Pupils" in Cracow. How can be explained the fact, that in spite of learning on the division of the Academy, where Maciejewski's pupils were receiving the education in graphics, many of them connected themselves with painting? The good painters often where the best graphics, on the other hand the graphics sometimes painted. It's the matter of personal experience and techniques. I always wanted to paint, and I chose the Division of Graphics to become independent from my father, who had been teaching on painting. Professor Maciejwski had created interesting workshop of painting and "infected" with his passion the students. He had created an immaculate mood of creative work. I really did appreciate him as a teacher. Do you have your own favorite painting? Every painting, in which I put a lot of my heart is like a child, which you'd like to keep, but then it "grows" and you are getting used to the fact that it isn't your own anymore. I liked few "windows" which left my workshop. I'm painting the new ones to let them be "the best" for a moment. Work wouldn't make any sense if the best had already been painted. Anna Fornelska was born in Przemysl in 1963. In 1988 she graduated Academy of Fine Arts in Cracow at the Division of Graphics. She had been studying in workshops of Roman Banaszewski, Wlodzimierz Kunz and Zbyslaw Marek Maciejewski. For a few years she lived in Tunisia with her husband, nowadays she lives and works in Cracow. She had had six individual exhibitions of her art. Her works can be seen in our gallery and on the artist's official website. She was one of the first Polish artists who decided to promote themselves in web. Her site was established in 2000.